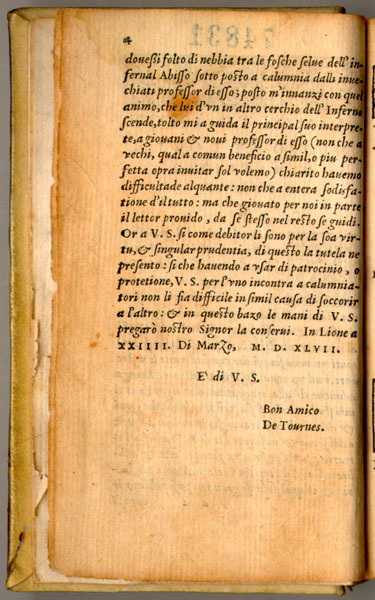 The preface (one, two) of Jean de Tournes, in which the Lyonnais editor dedicates this edition of Dante to the French poet Maurice Scève, is highly significant for literary history. First, the fact that the Frenchman de Tournes should wish to print an Italian edition of Dante, and could elegantly write his preface in that language, attests to the strong social, cultural and economic ties between Italy and the city of Lyons. Second, Maurice Scève clearly represented for Jean de Tournes the embodiment of the hopes of France to achieve the literary greatness already attained in Italy. This was not the first Italian work Jean de Tournes had dedicated to Scève. 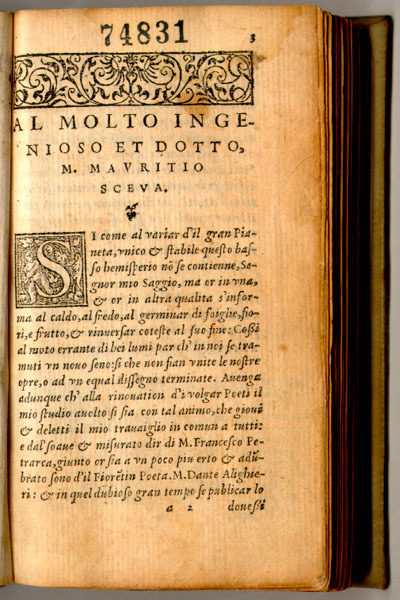 Just two years earlier, in 1545, de Tournes published Petrarch's Rime Sparse or Canzoniere, and likewise dedicated that edition to Scève in a similar preface written in Italian. De Tournes had many reasons to see in Scève a French Petrarch, for the poet had just published during the previous year his masterpiece, the Délie, the first canzoniere written in French, in which Petrarch's work is echoed on virtually every page. If De Tournes' dedication of his volume of Petrarch to Scève was done inrecognition of what Scève had already achieved as the new French Petrarch, his dedication of the Dante is, on the other hand, somewhat anticipatory of what Scève would write in the future. While the Délie had been written in a Petrarchan idiom, Scève soon abandoned that style in favor of what is known as "scientific poetry." His epic-like work, the Microcosme, was probably finished in 1559 though not published until 1562 -- appropriately, by Jean de Tournes. As its name suggests, the Microcosme was poetry on a grand scale, an encyclopedic work drawn from classical and biblical sources. It was concerned with the fall and redemption of mankind, and written in a style reminiscent of Dante. Even the text's three-part division, each book totaling 1000 lines, seems to recall the overallstructure of the Divine Comedy. Just how much of Dante there is in this text remains a question to be studied in greater depth; nevertheless it is highly suggestive to see Jean de Tournes' gift to Scève as a possible inspiration for the latter's most ambitious undertaking.